Wabatongushi by train! It was great to host the Outdoor Life Magazine guys last June at Loch Island Lodge on their fishing adventures via rail. Author Dave Karczynski and friends only had four days to hit the water, but had no problem in getting plenty of fish and some nice ones at that. With them was Brian Bergeson from Rip Lips Musky Fly company. Brian’s flies are well known and worked their magic on Wabatongushi without a doubt. Besides getting a monster 41” Pike and lots of nice Speckled Trout, they also hit the morel mushroom season right on target. You can check out their article in Spring 2018 Outdoor Life which is on news stands now (or via print / digital subscription…info below). Dave has a truly masterful way of describing their adventures on and off the lakes. There’s a moment unique to pike and muskie fishing—the sudden heave of water when a fish of mammoth proportions pushes through the shallows. You know something is coming, and you know that this something is big. What’s unclear, at least to a certain vestigial reptilian part of the brain, is whether the beast is coming after your fly or you. In this case, it happens on my second cast to a grassy peninsula where the shallow water quickly drops to deep. “Big!” I yell as I set the hook again and again, holding on and not giving an inch as the fish digs and rolls. It tapes out at 41 inches, my biggest pike ever. Returning to the lodge, I’m met with all the fanfare of a dragon slayer, beginning with beer and culminating in a trip to the bait house, where with a nub of chalk I add my name and the date to the Loch Island Lodge pike fishing hall of fame. Then we start to get our eyes. Past the oars, just beyond the visible, the shadows of brook trout dart about in the sunlit depths, crushing minnows. We go to sinking lines and weighted Muddlers, and start catching them in rapid succession. They’re all beautiful fish, and all more or less the same size and shape— plump bordering on corpulent. One of them coughs up a heap of scuds, which explains their fatness and promises a particularly succulent lunch: Few fish are as sweet as those finished on crustaceans. We fish for a few hours, and after catching dozens of fish, we retire to a shady island to build our lunch fire. 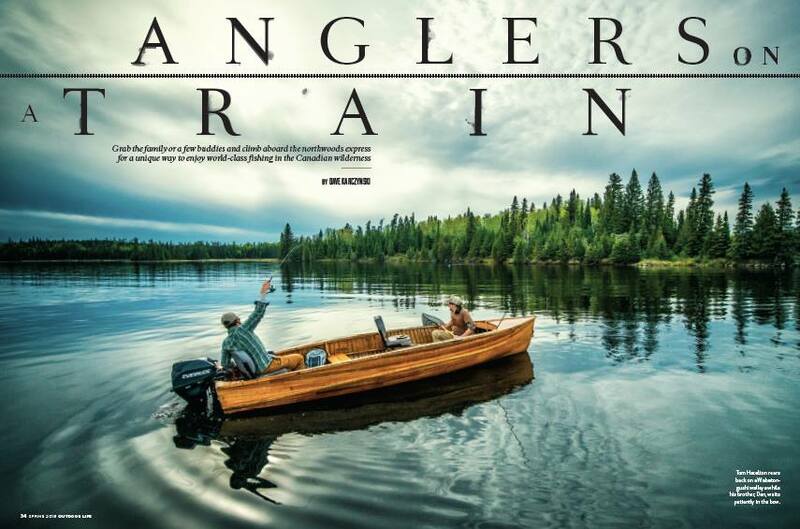 Be sure to read Dave’s complete “Anglers On A Train” article by finding the Outdoor Life Spring 2018 magazine at your local bookstore / news stand now. For other great online articles, and to subscribe to print or iPad/iPhone editions, visit Outdoor Life website at: https://www.outdoorlife.com Also available digitally on Amazon Kindle apps and devices.